Lecturers at universities all around the country are striking due to proposed changes to their pension schemes. The changes, which have been recommended by Universities UK, would leave lecturers approximately £200,000 worse off over their retirement. This is particularly insulting as Universities UK is an organisation of the countries’ vice chancellors, all of whom earn around six times the average pay of their staff. Lecturers working conditions are students’ learning conditions, therefore it is important that students support their lecturers who have been put in a very difficult position. Yes, the strikes may be disruptive, especially for final year students like myself who do not have long left of our degree, but we need to look at the wider picture. The continual marketisation of education is a big threat and if lecturers and university workers are not given more consideration by vice-chancellors and management then we risk losing them and ending up with the wrong types of people teaching us. There was a protest against the pension cuts attended by students, staff and Union members on the Leicester campus last week. 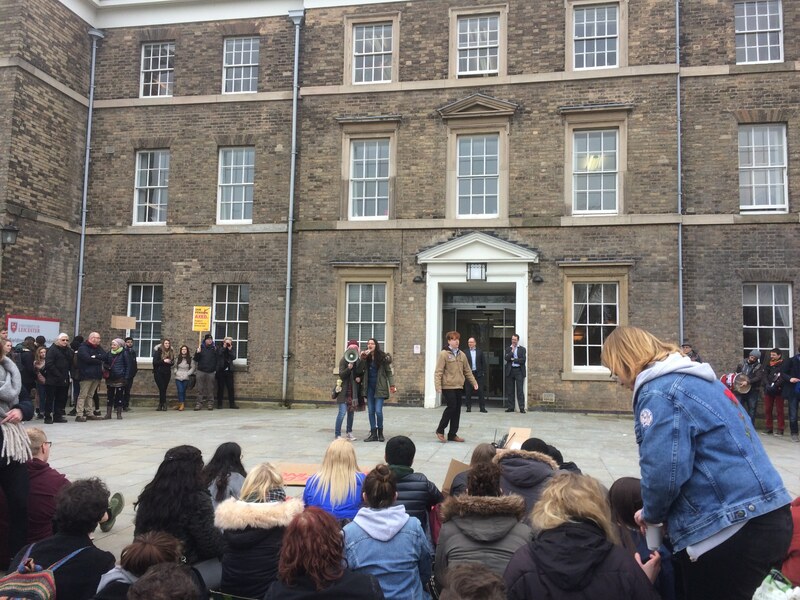 It was great to see so many people coming together and supporting each other, with students and lecturers alike making passionate and moving speeches. There was a strong message of unity but it is clear that people are not happy with the way things are going at the moment. It was also disheartening that our vice-chancellor was ‘overseas’ and therefore didn’t acknowledge what was going on. I’m hoping for everyone’s sake that the pensions dispute gets resolved and things can go back to normal. Bella you have a very good blog, and I admire you writing about issues you are passionate in.